Hey beer lovers, I've got a great piece of trivia for you all. Have you ever wondered how they make bock beer? Well, it sort of goes like this: Spring season is the traditional time when brewers will clean out their fermenting vessels. When they do, they will invariably find a dark black ooze deposited at the bottom of the tanks. It is with this murky sediment that the brewers forge a special brew for this time of year, and the magic of bock beer is born. This is why bock is so dark in color compared to traditional lagers and ales. Got it? Truly, I cannot fathom how such a ridiculous tall tale ever got started, but through the years I have been both amazed and dumbfounded at how many people I have met actually believe this myth to be true. I even had one occasion at a brewpub in Bucks County, PA where a self-proclaimed beer expert lectured me on this very fantasy. Incredibly, when I gently tried to correct his source of information he stubbornly stuck to his story. So much for beer enlightenment. But for those of you who still wander in the darkness of ignorance, I will do my best to enlighten. Certainly common sense would dictate that fermenters have to be cleaned more than once a year; in fact, every brewer does it meticulously every time a batch has been brewed. 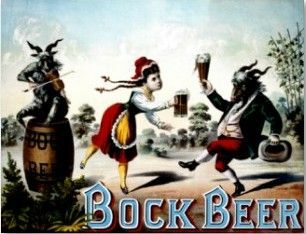 Bock beer is, simply, a strong lager of German origin that is brewed to celebrate the coming of the spring season and the renewal of life and growth that it brings. It is usually dark in color, but it may surprise some to learn that it does not have to be. To be a proper bock, the beer should be brewed from an original gravity of at least 1.064. This means that the unfermented wort that produced the bock will weigh at least 1.064 times an equal volume of water, and will produce a beer slightly over six percent alcohol by volume. Bock beer will classically have a rich malty flavor and only just enough hop bitterness to provide a token resistance to the malt sweetness. The term bock is not certain in origin, but some theorize that it may be traced to the city of Einbeck in Germany, and that the term bock was possibly once actually beck. This certainly makes me wonder what my German ancestors might have done for a living. It's all in the genes, my friends. One exceptional brew that may well be the world's most famous bock beer is brewed by the Paulaner brewery in Munich. It is known as Salvator, or the Savior's brew. Salvator is not your ordinary run-of-the-mill bock beer; it is actually a doppelbock, or double bock beer. Salvator is brewed from an original gravity of 1.074, and clocks in at nearly 7.5% alcohol by volume. This beer boasts a huge, mildly sweet malt character and alcoholic warmth. 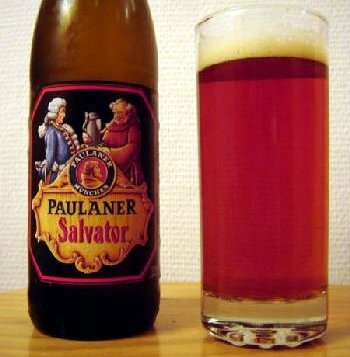 The name given to the Savior's brew is of special significance, since its lineage can be traced to a monastic beer that was brewed by Catholic monks in Bavaria. The monks endured long periods of fasting during Lent, and needed something to sustain them during the inevitable periods of hunger. One could well imagine a group of severely inebriated monks stumbling about after quaffing copious quantities of bock beer on empty stomachs. In truth, however, the original Savior's beer was probably somewhat lower in alcohol and higher in carbohydrates than the modern, secular version. So it was beers like this that actually gave rise to the idea of considering beer to be liquid bread. The brew was genuinely nourishing, so it helped the monks merrily on their way toward Easter. The holiday spirit of of bock beer did not fade with the demise of monastic brewing in Germany. To this day in small towns and hamlets across the Fatherland, spring festivals accompany the tapping of the first barrels of bock beer such as Salvator. In fact, for many years the Savior's brew itself would be tapped in early spring by none other than the mayor of Munich at a city festival. The release of bock beers has traditionally followed a regimented schedule. The dark, extra-strong double bock beers have normally been released in mid to late March, just as the first traces of winter thaw is underway. In April, as the spring gets into full swing, the dark single bock beers would become available. And the party doesn't end just yet. The month of May is the traditional time to release the Maibocks, or May bocks. Maibocks are, as defined by the style, always pale in color. At first glance they appear a bit like Pilsners but actually have a deeper golden color due to the larger quantity of malts. One superb example of the Maibock style is brewed by the renowned Spaten brewery, also in Munich. I have never seen it in bottled form, but have been lucky enough to sample a delicious draught version of it in late spring. It makes for a wonderful dessert beer due to its sweetness, but has just enough hop character to keep the glands salivating for one after another. What a wonderful way to whittle away an afternoon while viewing the cherry blossoms! Here in the U.S.A. it can be a challenge to find domestically brewed bock beers that are true to form. The Yuengling Brewery of Pottsville, PA occasionally brews a dark bock beer on draught during the spring months. It is a tasty and pleasant brew, but by old European standards of strength and gravity is not a true bock beer. A more authentic version of the style is brewed by the Boston Beer Company, maker of the Samuel Adams line of beers. 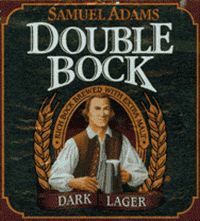 Samuel Adams Double Bock is brewed to a whopping nine percent alcohol by volume, topping even the traditional doppelbocks of Germany. It is a dizzying blend of malt and booze, and is not for the faint of heart. Due to its strength, it is only available in four-packs. I call that responsible marketing! Bock beer is great to share with friends when it is available. I have fond memories of imbibing various bock beers at the Ginger Man Pub in New York, which sports more than sixty beers on draught at any one particular time. The Ginger Man has frequently featured strong bocks in its selection, including Salvator and the also-famous Celebrator from the Ayinger brewery in Bavaria. But when enjoying these robust lagers, be sure to keep your head and not take leave of your senses. Otherwise, someone at the bar just might have you believing all of those stories about that mysterious black ooze again. And bock beer is way too good to be wasted on conspiracy theories!